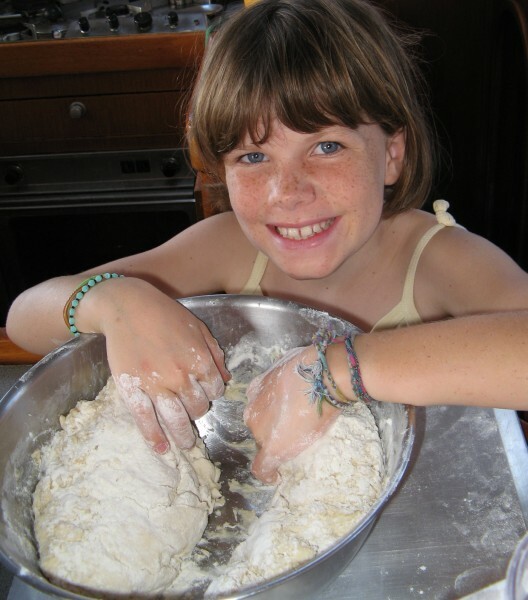 The best bread makers start young. Bread is excellent for lunch any time, or as an addition to another meal. When we're in port we usually buy it, just because it's easier than making it. 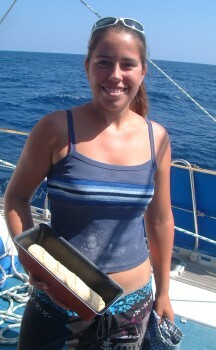 We especially like the French baguettes or the hot rolls that you can get every day at lunch time in the Seychelles. However, bread doesn't last long and only a few days out of port we'll run out. That's where we make it ourselves. It may sound daunting to make it by hand in this age of bread machines, but it can be done quite easily and simply. Keep the water between about 85-110°F (29-43°C). If you don't have a thermometer, that's warm enough that it feels warm when you stick your finger in, but not uncomfortably hot. If you're not sure, make it somewhat cooler. Hotter water kills the yeast, whereas cooler water just makes it rise slower. The overall ratio of dry to wet (i.e. flour to water or milk plus oil) should be greater than 2:1. Bread dough wants to be firm enough that it keeps its shape as it rises. However, use too much flour and it'll just turn into a brick, without rising at all. Flour also keeps the dough from being sticky, which is why you flour the board and your hands when kneading. Add somewhere between 1 tsp and 1 Tbsp of sugar to the water-yeast mixture (or just to the mix, if the yeast doesn't pre-bubble). This helps feed the yeast and makes it rise faster without making the dough discernibly sweeter. Knead the dough as much as you feel like it. Some recipes call for 10 minutes of kneading. Some call for two. Bread connoisseurs may disagree, but I've not seen too much difference between dough I knead for a long time and that which I just work the air out of. If I kneaded all my loaves a total of 20 minutes, I'd have arms as thick as my neck. Bread's not completely unforgiving. Even if the texture is bizarre, it should still taste like bread. Crusty, textured bread in 18 hours! This recipe was found in a newspaper back in the States. You don't need to knead the dough, and it uses a miniscule amount of yeast. Of course, you do have to think of making it the day before, but then nature does all the work while you get a good night's sleep. The bread that results is lovely and yeasty, almost like a French boule. Stir with fork or wooden spoon until well mixed. Let rest, covered, for 12-18 hours (preferably at 70˚F, which can be problematic on the boat). Place dough on floured board and work lightly until air is worked out. No need to knead, but add more flour if it's too soft to handle. Cover and let rest 15 minutes. Generously coat a cotton towel with flour or cornmeal. Place dough on towel, dust with more flour and cover with another towel. Let rise 2 more hours. Heat oven to 450˚F. Heat a large, heavy covered bowl (cast iron, enamel, Pyrex, ceramic... I've done stainless steel because it's all I have, but it's probably not as good that way. I also grease it.) in oven until hot. Place ready dough (doubled in size) upside down in pot. (Quite literally, pick it up and drop it in.) Gently push any stray edges down. Bake, covered, 30 minutes. Remove lid and bake another 15-30 minutes until browned. Turn out and cool before cutting. This recipe we adapted from one we got through the cruiser grapevine, this time from Kyle on Estrela. The original was from Betty Christian from Pitcairn Island, a direct descendant of Fletcher Christian of the mutiny on the HMS Bounty. What better place could you find a recipe for a tasty, long-lasting staple? It takes a long time to form each bread stick, so we also rolled the dough out into crackers. Both forms last well for several weeks at least in an airtight container . Knead the dough until no longer sticky. Roll pieces of dough (~1/4 c each) between hands or on cooking tray to form pencil-thick sticks of the desired length. Place close together on baking sheet. Bake 30-35 minutes in a ht oven. Cool. Store in an airtight container. Makes ~80 bread sticks. Add an extra 1/2 Tb baking powder to the dough. Knead until no longer sticky. Roll with rolling pin onto cooking tray until ~1/8-inch thick. Score lightly with knife into desired cracker sizes and poke centers several times with a fork. Bake 20-25 minutes in hot oven, removing outer crackers when they get brown. Cool and break apart. Store n an airtight container. Makes 5-6 trays of crackers. This has been a favorite onboard from the very beginning. It's a very good use of bananas, especially when they get to the stage where you don't want to eat them raw. It's best to put only a few bananas in a loaf because it gets heavy otherwise. This is also a very adaptable recipe. Amanda's been known to put in walnuts, apples or applesauce, or turn it more into a cake with milk and vanilla essence and baking powder. Once baked, the loaf can be refrigerated for a few days. It's wonderful served plain, with butter or cream cheese or, if you're feeling especially decadent, with peanut butter. Bake in a greased bread pan for ~1 hour or until cooked throughout. Cool at least 10 minutes before slicing. A sweet craving came over us one rainy afternoon in Chagos, but not a typical full-on, rich chocolate-type craving. 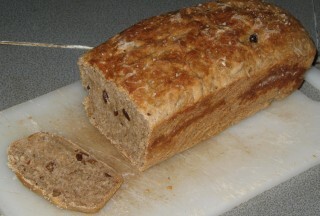 What resulted was this delicious cinnamon fruity, nutty sweet bread. 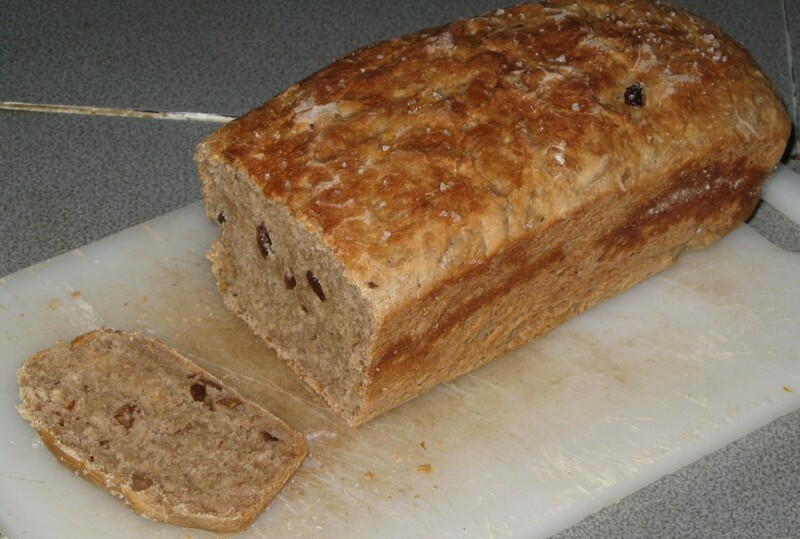 The Joy of Cooking advises only putting enough nuts and fruit into a loaf to equal 1/4 of the weight of the flour. I don't think I went anywhere near that limit, as I was just after a bit of flavor, not the complete texture of a Christmas loaf. Dabbling around with amounts of fruit is probably fine, though we had no problem with how this loaf came out. Now if only we had a toaster...! Let rise about an hour. Bake 30 minutes in a moderate oven. Pizza is a great meal for special occasions or for anytime you want something yummy that can be eaten with fingers. Of course there are many different ways you can make it - thin crust, thick crust, lots of toppings, fewer toppings. No two pizzas on Ocelot are ever the same. We used to make the dough using any bread recipe, but a true pizza dough is simple and only rises once. I have not yet perfected the spinning-dough-over-my-head technique, so I simply roll it out onto the tray or push it with my hands. This recipe calls for no oil, so be sure to grease the tray well or the crust will stick. Knead well until firm and elastic. Let rise 20 minutes. Divide into two equal balls. Push onto greased trays with oiled hands. Top with favorite toppings and then bake 20 minutes or until crust turns lightly golden. In Phuket, Thailand, we picked up a bag of what looks to me like bird seed but goes remarkably well in bread, as long as you don't use too much of it. It makes plain bread slightly bitter, so I add honey to my Fake-it Bread recipe along with the grains to make a darker, more fulfilling loaf. Adding the grains to the wet mixture early ensures that they soften somewhat before getting stuck in your teeth. Knead until all flour is blended to make a soft dough. Let rise 1 hour in greased bowl. Punch down and knead for 5-10 minutes. Form into loaf (or two loaves). Bake 30-40 minutes. When we already have bread dough in the fridge, this is a quick starch-addition to any dinner, or for a potluck. Allow focaccio to rise as the oven pre-heats, or longer. Bake 20 minutes or until top is lightly golden. This one I created after deciding the Refrigerator Bread took too much butter and was far too rich. The recipe makes 2 small loaves or 1 big one, or pizza dough or really whatever you want. It's more bread-esque than the Refrigerator Bread, as I discovered when I made a loaf of that rich monstrosity after months of this recipe. 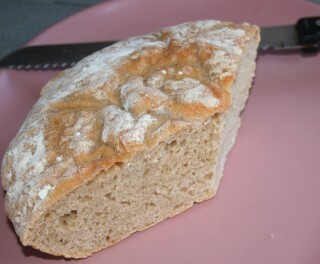 I also use this recipe as a base for a 7-grain bread (above). Knead until all flour is blended to make a soft dough. Let rise 1 hour in greased bowl. Punch down and knead for 5-10 minutes. Form into 2 loaves. Bake 20-30 minutes. Referred to later as our "Normal Bread Recipe.". Makes 4 loaves. As can be guessed by the name, this recipe can be made in bulk and refrigerated for up to 5 days. The large amounts of butter and sugar are what allow this, which means it makes a rich, almost cakey bread. Good for sweet rolls. 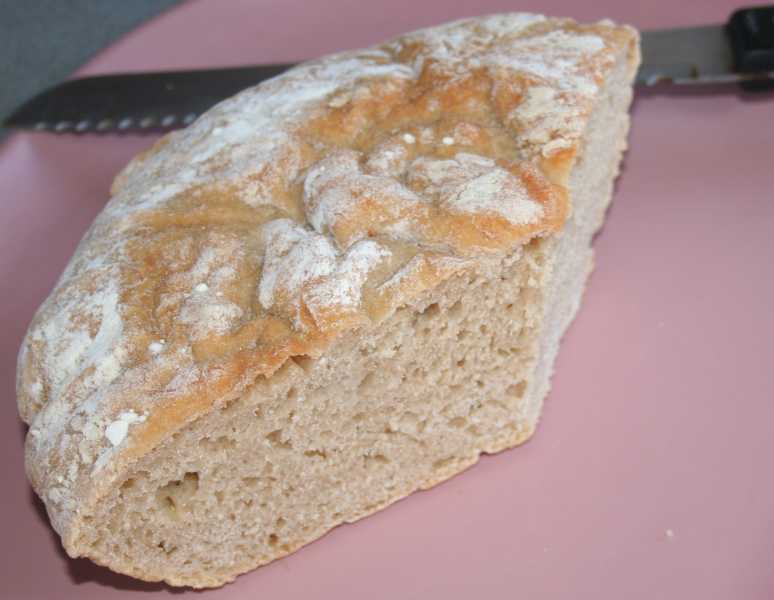 Before we found other bread recipes, we used to make a full recipe every week. Let dough rise in a warm place (not hard to find on the boat!) for fast use, or refrigerate for up to 5 days. We use this recipe for Herb-Cheese Bread, Basil-Tomato Bread, Cinnamon Rolls, Focaccio, and Pizza.